The MAYFLOWER II inside her temporary shelter in the Shipyard where Museum shipwrights and Plimoth Plantation staff members are carrying out her restoration. The historic Mayflower II, which is owned by Plimoth Plantation, arrived at Mystic Seaport Museum in early November 2016 to continue a multi-year restoration in the Henry B. duPont Preservation Shipyard. The project is scheduled for completion in fall 2019, after which time the ship will return to Plymouth to participate in the 400th anniversary of the Pilgrims’ arrival in 2020. The ship is hauled out of the water in the yard. Due to the nature of the work, visitors are not able to board the vessel, although she will be on display in the Shipyard during the restoration. Mayflower II is a reproduction of the original Mayflower that transported the Pilgrims to Massachusetts in 1620. It was Englishman Warwick Charlton’s idea to build Mayflower II; he wanted to commemorate the historic ties between England and America, which were strengthened during World War II. Plimoth Plantation agreed to maintain and exhibit Mayflower II once she reached the United States. The new ship was built in 1955-57 at Upham Shipyard in the town of Brixham in Devon, England. She sailed to the United States in 1957. 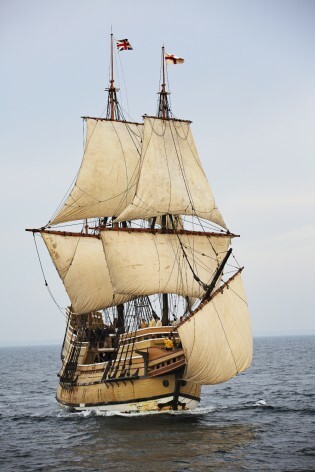 The vessel is a full-scale reproduction of the original Mayflower. The details of the ship, from the solid oak timbers and tarred hemp rigging to the wood and horn lanterns and hand-colored maps, were carefully re-created to give visitors a sense of what the original 17th-century vessel was like. Mayflower II does feature a few modifications, with the most notable difference being the large, modern staircase between the main and lower decks. (In the 17th century ladders were used.) Electric lights illuminating the dark corners of the lower deck were also not standard in the 1600s. Other minor modifications were made to Mayflower II to make sure the vessel would be accessible, safe, and comfortable for the visiting public. The celebrated ship is a major exhibit of Plimoth Plantation and a leading tourism attraction in the Commonwealth of Massachusetts, drawing millions of people from around the world to Plymouth’s historic waterfront to learn about the nation’s early Colonial history. MAYFLOWER II lead shipwright Matt Barnes chronicles the journey of the Belle Chasse live oak from log to futtock. The Shipyard is busy working on structural elements of the MAYFLOWER II. Live oaks from the Gulf Coast will be part of the restored MAYFLOWER II. The two-story frame is designed to maintain the integrity of the ship’s hull. The ship was hauled out of the water in the Shipyard so restoration work can begin in earnest.